ALLEGED corrupt politicians and bankers have been denounced on a bus launched by Podemos. Party leader Pablo Iglesias said it had launched the bus in Madrid to shed light on the problem of corruption and other illegal practices. 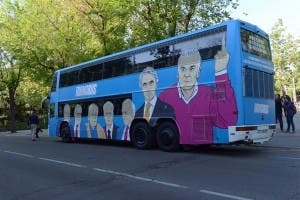 The caricatures represent those who have either been jailed for corruption, represent an organisation under investigation or having alleged strong links to corrupt people, according to the party. Other parties have criticised the bus, with PSOE ex-leader Pedro Sanchez denouncing it as repugnant for having included Gonzalez. He was leader during probes into illegal party financing and financing of militants to fight ETA. Lets have a list of all the politicians, along with their respective parties, that have been found guilty of some crime while in office and what the sanction was please OP. GOOD Barclay Bank Spain issued a mortgage i 2005 on mt property which was illegal. Barclays Bank Spain refused to give me access to the Initial Survey of my property for over SIX years and only when I approached the EU. The Initial Survey clearly shows that my property was illegal. During the time that I did not have this document TWO “investigations” were conducted by Barclays Head Office in Madrid and said that the mortgage was issued correctly. I was not present at these “investigations” as I would have asked to see the Initial Survey. Antony Jenkins was the C.E.O. of Spain when this occurred and he was promoted to C.E.O. of Barclays UK and he sold their Spanish Banks with the backing of McFarlane the CHAIR. I had sent a recorded delivery letter , with evidence to the present C.E.O. Mr Staley and the present CHAIR Mr McFarlane abd yet again no reply. Mr McFarlane Chair of Barclays Bank UK “SACKED” Antony Jenkins and gave him a pay-off of £24 MILLION. Barclays Bank Spain also had advertisements in their Branches saying that Barclays Bank Spain was a subsidiary of Barclays Bank UK and is registered with the (then) F.S.A. number 120272 which was FRAUD as the (then) F.S.A. only covered the UK. Also the F.S.A. number 120272 was and invalid number per the F.O.I. office Yet another FRAUD. You don’t know if you don’t try tam. At least someone is having a go. It will likely make them a bigger target in the PP dominated media.